Justice League #13 Review – AiPT! Justice League lead by Scott Snyder and James Tynion IV has been a delight, pushing the team book to new heights. From the amount of story and content in each issue, to the inspired flip of giving the Legion of Doom a story every few issues, this has been one of the best superhero team reads in some time. 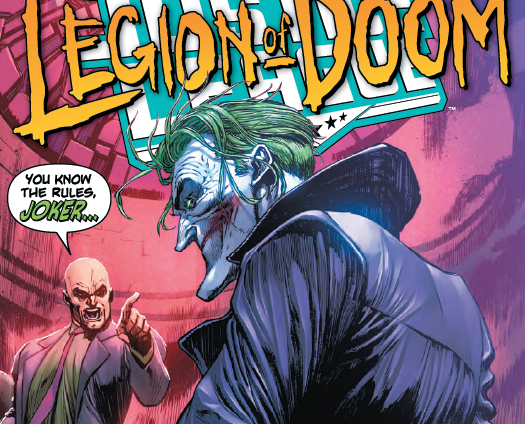 In the latest issue out this week, Tynion takes focus on Joker and Lex Luthor revealing a deal they made that could ruin the Legion of Doom forever. It’s on–the Totality will totally total the Multiverse! What could possibly go wrong when the Legion of Doom gets their hands on it? Plus, what is the connection between JUSTICE LEAGUE and the new BATMAN WHO LAUGHS miniseries from Scott Snyder and Jock? This issue pits two of DC Comics’ greatest villains against each other while also revealing why they have beef at all. It also builds towards a new Legion of Doom and plays around with villains in a creative way. If you ever wondered what villains were up to when they weren’t getting their butts kicked from superheroes read this. This is a great issue if you’ve been reading along so far and if you enjoy Batman Who Laughs. Tynion has done a good job weaving in a purpose as to why Joker and Lex are at war here and it actually makes a lot of sense. Both characters are clearly strong in ego and it’s fun to see how the war with each other physically and mentally. By the end, you get a sense of Joker’s take on the Legion of Doom, but also villainy in general. It’s a strong issue too because it carries forward Lex’s goal to rule the cosmos. There are a few hurt feelings in there too when Lex finds out Joker is out to get him since he had so much respect for him. If you’re a big fan of Joker you’ll love this issue. Lex has always been the smartest villain there is (depending on how powerful Brainiac is at the time of course) but you’ll gain a newfound respect for Joker after this issue. He’s a bit of a genius himself, but in his chaotic nature, it can sometimes seem like he’s not smart at all. This issue proves otherwise. I’m impressed with Guillem March’s work on this issue and in particular how freakish he’s made Joker. The character has had many faces (he even has a few in this very issue), but March adds another layer of haunting horror to the character’s face. He does this by not showing his eyes and instead casting them in darkness, as if he’s the embodiment of horror. There are also interesting details in his face as if he’s been carved from stone. He can go from serious intensity to silly concern in a heartbeat and March has outdone himself with Joker here. March does a wicked job with the many other villains that pop up in this issue and there is a dark tone throughout that helps cast this story in a scary light. This is an epic battle and the intensity, and perfect pacing, is largely due to March’s work here. Joker is downright haunting in this issue. It’s a bit surprising how the villains Joker messes with in this issue shrug things off. If Joker is capable of basically taking out the entire Legion of Doom (and then some) shouldn’t they be a bit worried they’ll lose not just to him, but anybody else? It’s also a tad frustrating to see how Joker’s plans are thwarted since it follows a convenient path for the plot. This series has been a delight and this issue delivers. The narrative here comes as a bit of a surprise, revealing why Joker has been so subdued while wrapping all that into a Lex vs. Joker battle for the ages. You will come away respecting Joker a hell of a lot more.